Welcome and Thank-you for visiting the home of Rugerlane. We are small home based hobby breeder located in Southern Alberta. The name RUGERLANE is a combination of two special dogs in our lives one that is still with us today “ TULANE” and our Rottweiler “RUGER” who unfortunately left us back in 2016. We have only been in Bulldogs for approximately 5 years but my love for dogs and all animals started when I was a young child and my dad brought me home my first dog a rough collie appropriately named “Lassie”. 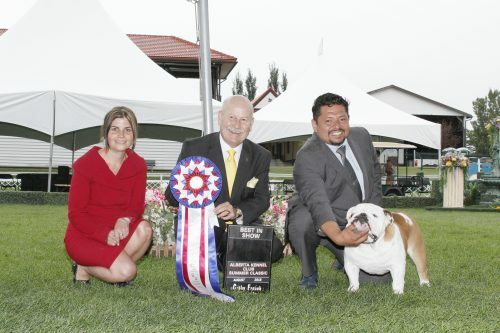 I think it’s really important to show how versatile Bulldogs are so I spend a lot of time doing many activities with my fur kids from Confirmation, Rally, Agility, herding, Scent Detection you name it and we will give it a try. I always encourage people to do your research and make sure that Bulldogs are the right dog for your family and lifestyle. I feel they do come with their own set of unique needs and I would consider them a little more high maintenance than other breeds but I couldn’t imagine my world without one of them in it. Video courtesy of Elizabeth Hugo.